You’ve probably seen the commercial at some point. 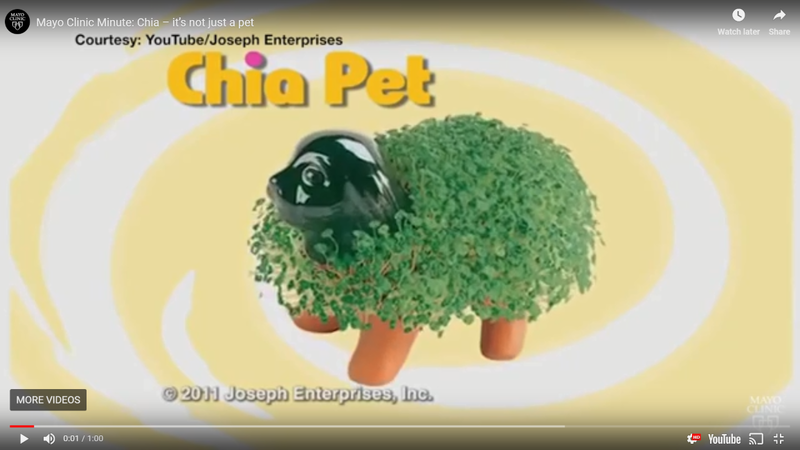 Chia Pets are fun figurines that grow chia sprouts that resemble an animal’s fur or human hair. But chia also is something you can eat, and it has some serious health benefits. It’s not just a popular “pet.” Chia is actually a seed. It’s high in protein, fiber, omega-3 fatty acids and antioxidants. If you’re adding chia seeds to a dish, a typical serving is two tablespoons, which is around 4 grams of protein, 10 grams of fiber and 140 calories. “Some of my favorite ways to use chia seeds is sprinkled into salads or breakfast cereals. I also like mixing [them] into my smoothies in the morning,” says Guy. Try mixing them with a liquid to form a gel that can be added to your smoothie or any other food. There’s little taste to the seeds, so you’re not changing the flavor but still gaining the health benefits. “Chia seeds are a complete protein — meaning that they have all nine essential amino acids that the body cannot make,” says Guy.